Most of the user have an active ad blocker installed, according to some reports. When you consider that Chrome has come prepackaged with ad-blocking capabilities since February of 2018, the picture for online advertising looks bleak. Chrome’s new feature may just be the key to saving the ad-funded web.For those business owners who rely on advertising to monetize their websites, however, that’s not an immediate concern. Ad blocking and advertising are a nuanced coexistence, and there’s no cut-and-dry answer. Today, we’ll dive into the relationship between ad blocking, advertisers, Google, and your website. Then, we’ll cover actionable alternatives for monetizing your site. You can always gate your content, similar to how Business Insider does it here. On the one hand, this may help you capture revenue by getting users to sign up for special memberships (more on that later). On the other, you may lose that lead entirely if they decide to move on to greener, more ad-block-friendly pastures. Alternatively, you can take an even more aggressive approach and circumvent the technology altogether by “blocking the adblocker,” but that’s even more of a gamble. You could just end up investing funds in forcing ads in front of prospects who’ve already indicated that they don’t want to see them. At best, you’ll lose money. At worst, you’ll frustrate your users. And keep in mind that this approach is only valid for users who aren’t already on Chrome, the world’s most popular browser. So, your mileage may vary on that approach. Plus, you can always just ask. The fastest way through a locked door is often knocking, after all. Here’s an example from Nexus Mods. This request unobtrusively fills the space where the advertisement would be. It maintains the user’s experience and gives them something to think about. Here’s another example from Credit One Bank, a financial services/credit provider. In both cases, users are given a request (but not a compulsion) to whitelist the provider. If they’re interested in browsing the website or using the service, they can still get to know the website with the security blanket of an ad blocker. 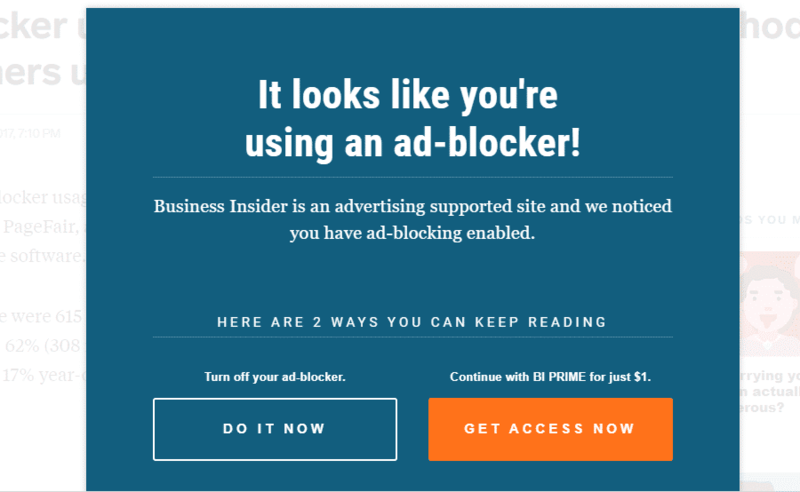 By contrast, users who visit Business Insider have to decide then and there between a purchase, removing their ad blocker, or leaving. If they’re not already sufficiently motivated to pay or turn off their ad blocker, they won’t have the opportunity to find that motivation on their own. Now that you know how third-party ad blockers work and your potential solutions, let’s talk about how Chrome differs — and how it doesn’t. Instead of trying to wrangle compliance and make your old advertisement strategy work in this brave new ad blocking world, why not turn to alternative (and often lucrative) solutions for monetizing your site? Let’s talk about five of them now.